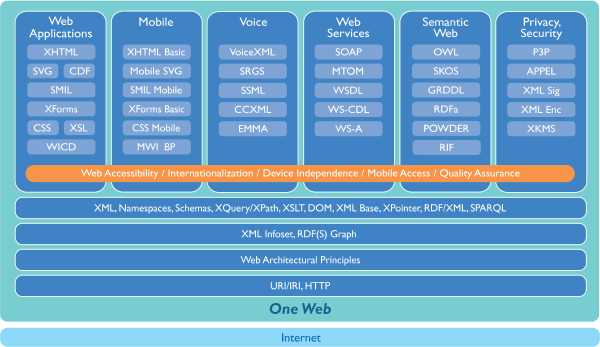 The W3C Technology Stack illustration depicts a model of two layers: the Web architecture (also labelled as “One Web”) built on top of the Internet architecture. The illustration fleshes out the middle Web layer by showing the areas of interest and technologies developed at W3C. On top of these layers sit six boxes, corresponding to groups of major W3C Activities: Web Applications, Mobile, Voice, Web Services, Semantic Web, and Privacy. The Interaction box lists XHTML, SVG, CDF, SMIL, XForms, CSS, and WCID. The Mobile box lists XHTML Basic, Mobile SVG, SMIL Mobile, XForms Basic, CSS Mobile, MWI BP. The Web Services box lists SOAP, XOP, WSDL, WS-CDL, and WS-A. The Semantic Web box lists OWL, SKOS, and RIF. A red and yellow banner (representing horizontal coordination at W3C) ties these four areas together and reads: Web Accessibility, Internationalization, Mobile Access, Device Independence, and Quality Assurance.